WAFC's spring 2018 clique league is scheduled to start today! 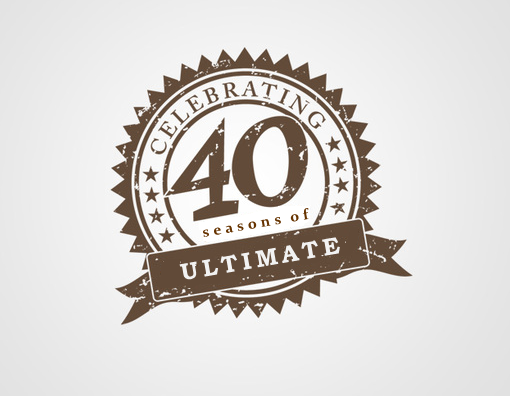 This season marks Sludge's 40th season (20 consecutive years) of playing league ultimate in the DC-area. 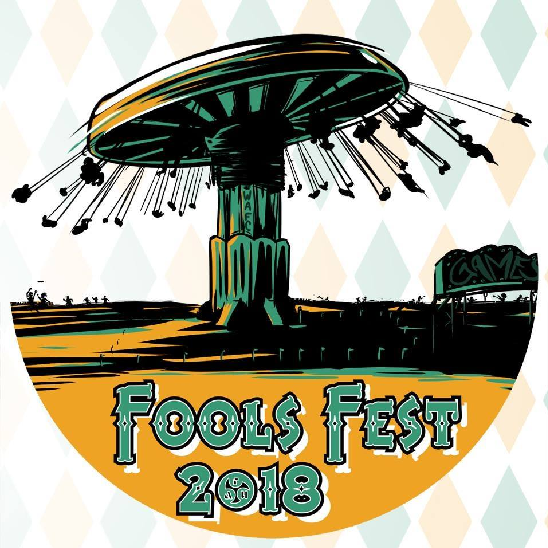 Nearly 50 ultimate teams are heading to Fredericksburg,Virginia, for the annual shenanigans that is Fools Fest. Play starts on Friday, March 31 and ends on Sunday, April 1. The theme for Fools Fest 41 is the state fair! For 2018, Fools Fest will replace flipping for pull and side with spirit games. Each team will play a short (less than 5 min) spirit game with their opponent to begin each round. The spirit game must be state fair themed and not be dependent on alcohol. The "home team" (AKA the team listed first in the program) will play their spirit game to decide who will start on offense/defense. The "away team" (AKA the team listed second in the program) will play their spirit game to decide which side of the field each team starts on. As part of registration, each team was required to send a poem that describes their team, their theme, and their spirit game. As always, the action photos from Fools Fest are the funnest. The Crosswind Tour (XWTour) began in early January 2018 and is scheduled to end in April in California. The XWTour stops in the DC area this afternoon- March 28 - with a visit to Arlington Public Library. Join Upwind and the founders of the American Equity Invite to talk about how youth can make an impact in the future change of ultimate. 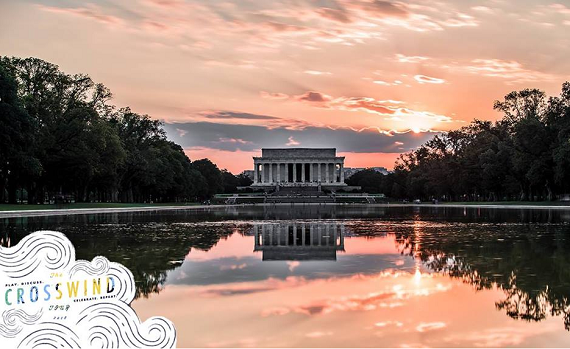 The mission of the American Equity Invite is "as a youth girls Ultimate Frisbee team is to create a tournament environment that solely focuses on the youth girls division. 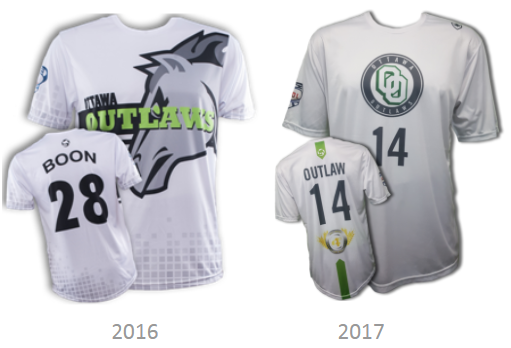 While the opportunities for female-identifying and non-binary players have increased over the years, we still feel that we do not have the same access to Ultimate as our male-identifying counterparts. By hosting this unique tournament, we hope to highlight the strength of youth girls Ultimate nation-wide by catering to the needs of highly competitive teams all over the country. Our goal is not only to make a statement to those not involved with the youth girls division that there is immense talent, a relatively untapped market, and enormous potential in these young players, but also to provide a safe and encouraging environment where female-identifying and non-binary youth can find further strength and confidence in their athleticism, competitiveness, and ability to lead. We plan to establish this positive tournament culture and environment by having this tournament run by a group of the people it is meant to benefit and by taking feedback throughout the tournament and planning process." Upwind Ultimate's vision is to increase the value and visibility of women in ultimate by investing in gender equity initiatives. This event is part of The Crosswind Tour, where we will connect with thousands of people in over 40 cities across North America. 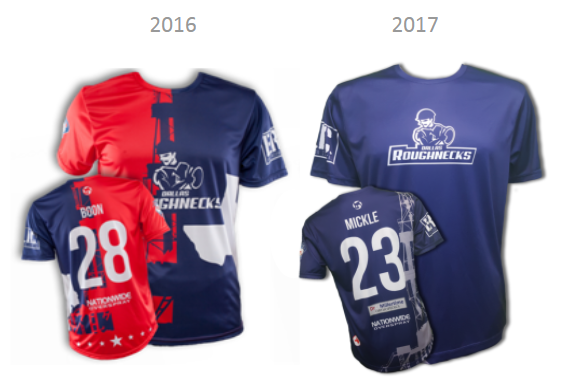 Not every American Ultimate Disc League team updated their jerseys in the 2017 season. 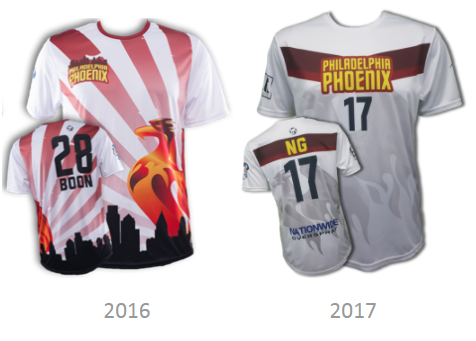 The AUDL teams that did are reviewed with their 2016 jersey as a comparison. 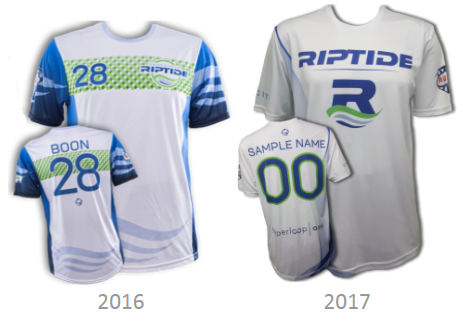 A more thorough AUDL jersey review was conducted for all teams for the 2016 season. Light: Major improvement from 2016 to 2017. The Rush logo pops and the black patch across the shoulder favorably frames this jersey. Dark: The red Rush logo on a red shirt (2016)? So bad. 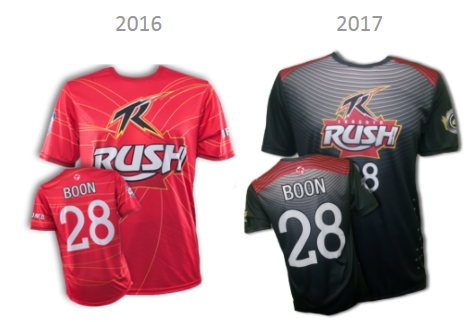 The red Rush logo on a black jersey? So good! Lines on the breastplace and shoulder blades lend a nice textured flow to the 2017 jersey. 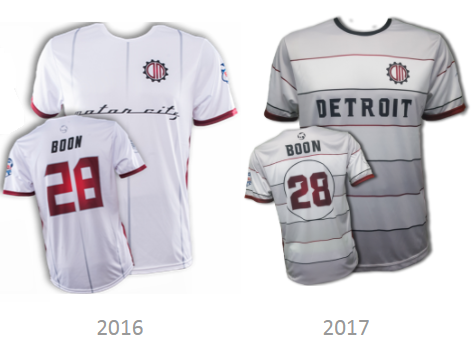 Light: Detroit improved in 2017; especially like the circled number on the back similar to the numbering style on a race car. 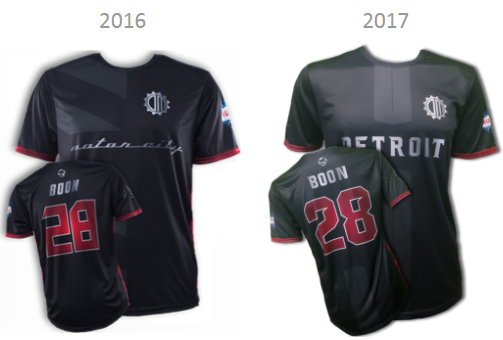 Dark: Not much change from 2016 except the better branding of Detroit instead of 2016's "motor city." Light: Hey! Ottawa Outlaws got itself a new alternative "OO" logo! And with it, a major improvement from 2016 to 2017. Dark: The horse head is more reasonably sized on the 2017 jersey which looks better, of course, of course. 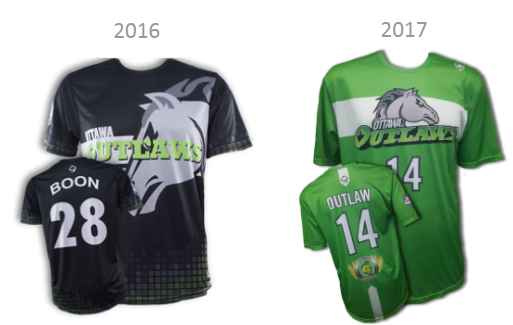 And, Ottawa successfully pulls off putting their green OUTLAWS team name on a green jersey. Light/Dark: Philadelphia improves in 2017 with a more crisp look. 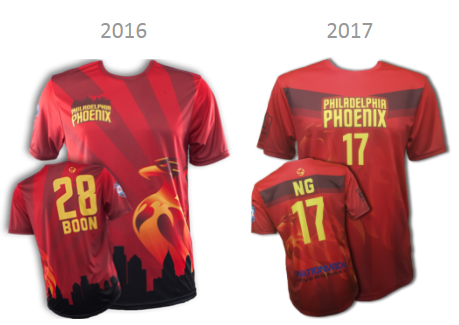 The Phoenix flames add a subtle texture to the shirt. Though, the 2017 design shows up much better on the white jersey (above) than the red (below). 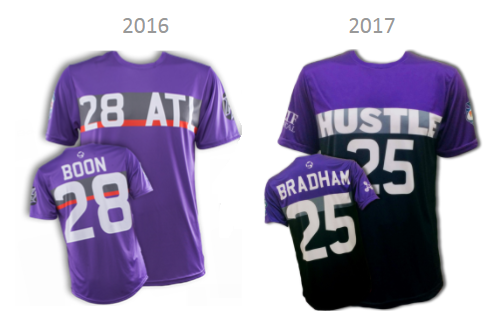 Light: The 2017 top is identical to 2016's except "ATL" was replaced with the Hustle's H logo which represents nicely on the left chest. Dark: Gone is the so-very-purple tops. 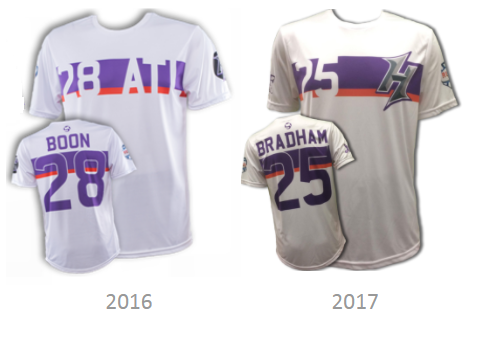 Atlanta smartly decreased the use of purple in 2017 for a predominantly black jersey. Light: In 2017, Minnesota reigned in their abstract design concepts in favor of the outdoor elements - icicles on the shoulders and evergreens on bottom - which give prominence to their clean M logo. Dark: The Wind Chill carry over the basic design from 2016, but with better clarity; less competing shapes and lines in 2017. Light/Dark: Vancouver ripped up their 2016 jerseys for a more basic jersey in 2017. 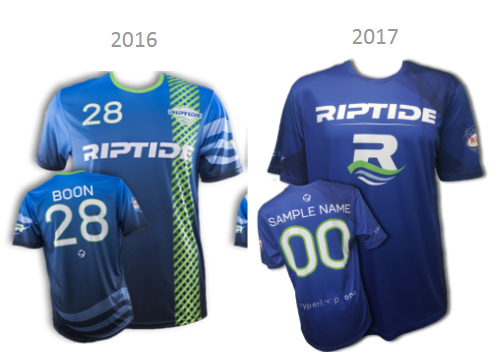 The riptide-y "R" was a new identity for the team. The most interesting element for this jersey was the Hyperloop | One sponsorship. 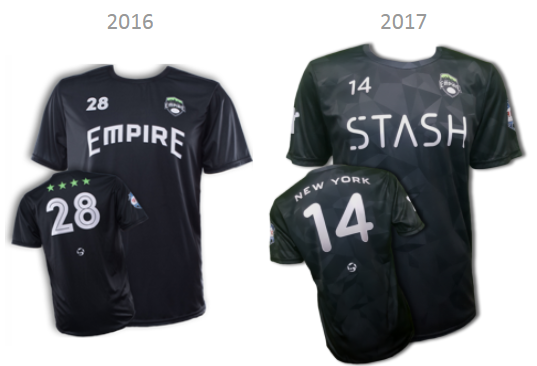 Dark: The 2016 New York Empire's simple and minimal dark jersey did not need a change, yet unfortunately in 2017 an ambiguous pattern (bleh!) was added and an unknown sponsor replaced the team name. Dark: Dallas needed to update its busy jersey from 2016. The Roughnecks simplified in 2017 for the better and satisfactorily addorn the back with an oil derrick. Light: Seriously, someone forgot to design San Diego's jersey for the 2017 season. 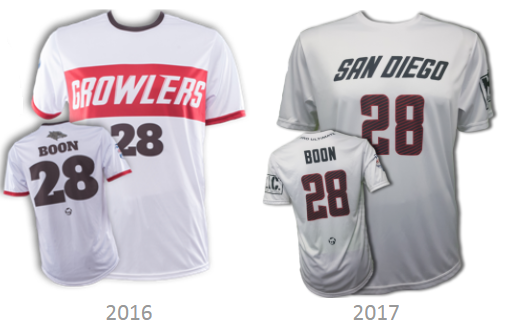 Dark: San Diego's dark jerseys in 2017 had a diamond (or is it a fence?) pattern that does not add much to the black top. 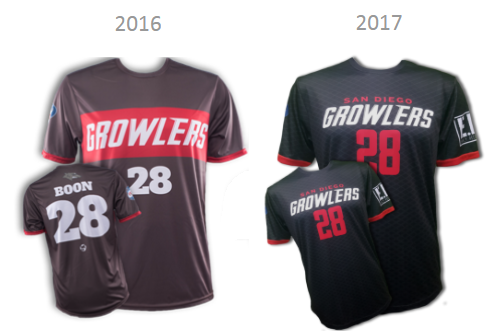 The Growlers name is better sized across the chest than in 2016. 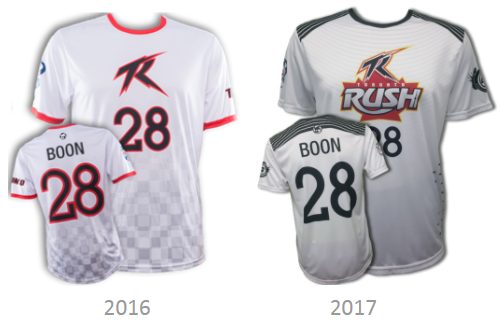 AUDL team custom jerseys are available for $50 each via the AUDL Online Shop. 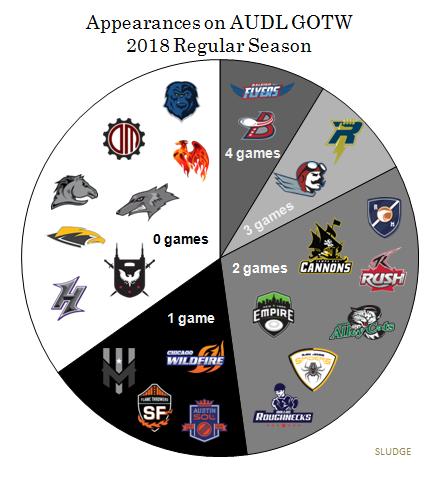 Fifteen out of the 23 American Ultimate Disc League teams will be featured on the AUDL 'Game of the Week' in the 2018 regular season. There will be a total of 16 games - one game every week - during the regular season. AUDL East teams will be broadcast the most (10 times), followed by South teams (9 times), then Midwest (7) and West (6). Washington, D.C. Breeze and Raleigh Flyers will be broadcast 4 times each — including their Week 7 matchup. 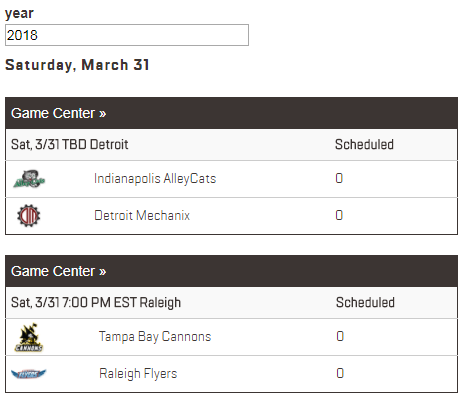 +Four inter-divisional games (Weeks 3, 4, 7, 9). The 2018 season of American Ultimate Disc League begins in 18 days. 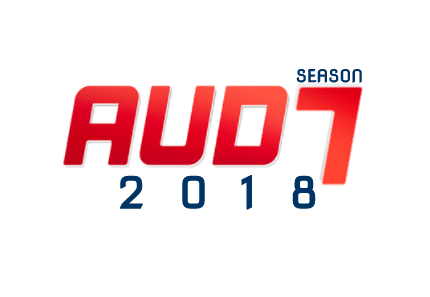 This year featuring 23 teams in 4 divisions will be AUDL's 7th season of semi-pro ultimate. 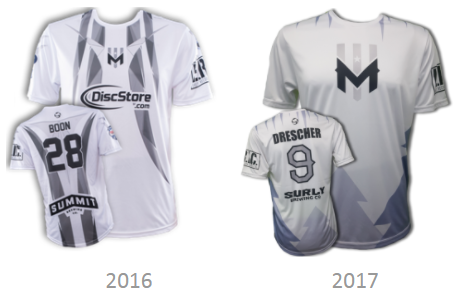 The March 31 start date is the earliest the AUDL has begun in its 7 year history. According to Beau's self-published article on Skyd, he will be on the roster of the New York Empire for the 2018 season of American Ultimate Disc League. 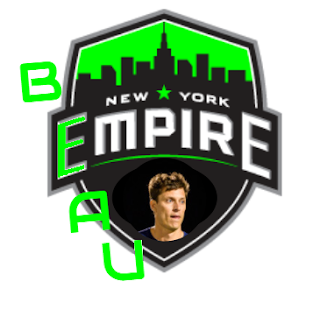 In his own words, Beau says: "I have no contract and no written agreement with the New York Empire." Previously, Beau has played for the San Jose Spiders (2014-15), Dallas Roughnecks (2016), and San Francisco FlameThrowers (2017). New York finished 4th in the East Division with a (6-8) record in 2017, and missed the postseason for the first time in their 5 seasons. 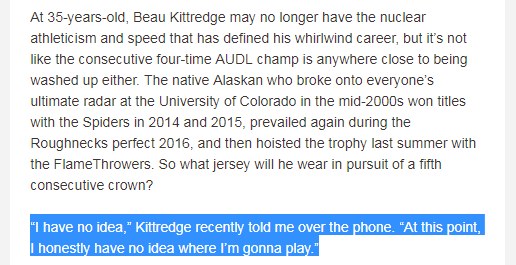 In February 2018, Beau told Evan Lepler: "I have no idea. At this point, I honestly have no idea where I'm gonna play." 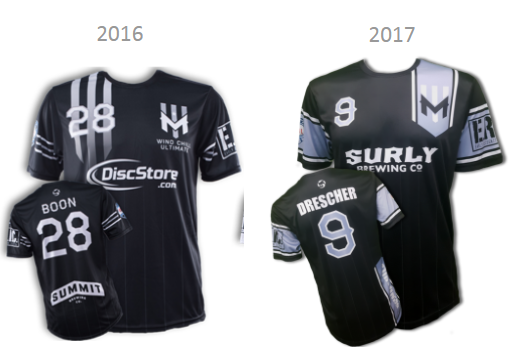 In January 2018, Beau wrote: "I will put a priority on playing in the league most willing to make pro ultimate a reality for everyone. In 2018, I will play for free in the AUDL city most willing to help AUDLx [a mixed-gender league]. 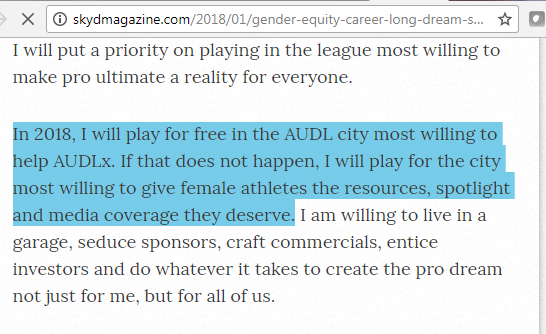 If that does not happen, I will play for the city most willing to give female athletes the resources, spotlight and media coverage they deserve." Welcome to the AUDL East, Beau!